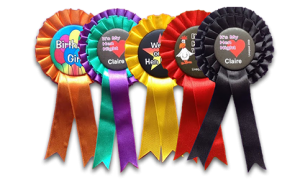 Personalised Rosettes are perhaps not the first thing that you would spring to mind when planning a birthday party, hen night or stag night. They are however a very economical and simple way to add a special extra something to an event. If it’s a birthday celebration then what better way to highlight the birthday boy or girl. It goes one better than just giving them a badge. For hen nights and stag nights it is a great addition for the Bride or Stag. It is something that is personalised with the person’s name and if required, also with the date and venue. Not only this, but it is a great souvenir of the special day. Of course their uses are not just limited to parties. 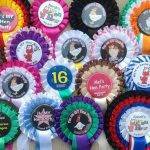 We can supply personalised rosettes for use at exhibitions, for awards at shows and competitions. We always carry a large stock of ribbon in a large variety of colours so we can make any colour combination of rosette. In addition we can colour co-ordinate the ribbon colour to your club colours or corporate colours. We offer our standard rosettes in a one, two and three layer format. Just choose the style that suits your occasion. We use ribbon of top quality and which is heavily pleated to give a very deep ruffle. This in turn gives a very high quality appearance to the rosette. the centre of our rosettes is based on a 57mm diameter badge. This means that we can print the centre in full colour. In addition it means that we can also print a photograph on the centre. Because of the printing method we use for the centre there is no minimum order quantity. So if required we can add different text to the centre of each of the rosettes, without it incurring a large cost penalty.